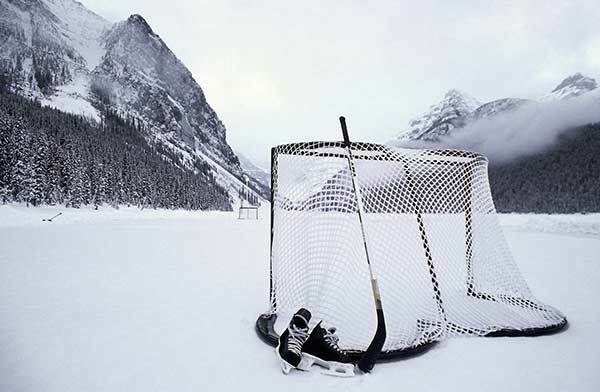 As kids, we played a lot of pond hockey; the differences between pond and rink hockey are many, with boundaries being just one. In pond hockey, there are no boards to get body-checked into, only frozen roots to trip over. Our penalty box was several large rocks bordering the south side. Regulation play teams have 6 players; with five kids in our family, and a smattering of cousins along, we took turns as goalie, and playing forward or defense. I loved getting the puck and confidently skating towards the opposing goal. I didn’t get there often, as my cousins and brothers were much stronger and faster than I, but what I lacked in size, I made up for in determination. Each of us dreaded being goalie; having to defend the net (and our heads) from slap shots. I remember the fear; the lack of protection, knowing what was coming and doing my best to stop it. I’ve come to see that childhood roles can still play out in our adult lives. How? I’m used to being the forward; being in control, moving with intention and taking my best shots. I rarely have to play defense. Why? Because playing defense means that I have done something to defend. When someone else puts me on the defense, I’m transported back to that gangly kid again… wondering how exactly it got to be my turn at net. It happened to me. Someone took a position polar opposite mine. That’s fine, it’s a free country after all, I thought. But it wasn’t fine. You see, being opposite of this person is not done. Their approach, and their subsequent attack of me, rocked me and then some. Sweat formed, my stomach fell and a familiar surge of terror took hold. I stumbled my way through, listening in disbelief and wonder at how this came to be. I tried to state that I didn’t mind how apart we were on the issue but, you see, that was the issue. Not just that we didn’t agree … but that I was clearly so wrong and it was their job to set me right. Sometimes, in those moments, that former scrappy kid is tempted to re-emerge. Some swagger could step forward. More realistically .. disbelief and shock immobilize and quietly, I’ll just take the hit. I’ll take it … just to get it over with. And later, when I get back up, disappointment’s slap lingers on my face and my heart. The stings come again when I realize I was never wrong to feel what I felt; I was wrong to believe that my thoughts and opinions had a place at their table. It mattered not that we thought differently on this topic, to me. And in the end, that was all that mattered to them. What couldn’t be seen from the other side was how any other position could ever be played. What couldn’t be seen – will never be seen – is why play any other way than theirs. Talked to like a child, reprimanded like a fool, I heard life pleading with me to load up on safety gear, hover in one spot and play defense. I won’t do it. I don’t want to live like that. I’ll never get used to being emotionally body-checked but I’ve learned that moving forward means that, sadly, there will always be a few who’d rather knock me to into the boards than see me get to goal. Has someone else ever forced you to into a role you didn’t want to play? Do you have any forwards skating alongside you in life? I think we often get pushed into roles we don’t actively choose or forced to take positions we aren’t crazy about. I guess the lessons learned are what matters most. And we always learn one from your blog posts. Yes, the lessons are what matter – for me, I learned, to my horror, that I am still naive. I still expect the best in others, I don’t look for hidden agendas, and am surprised when someone I thought respected me doubles back for a dirty fight. Never look for it, don’t imagine it, and am always horrified when it occurs. Very thought provoking. I readily take the hit….better me, than someone else, after all. I’ve lived, cowering in that goal, with my mom coming at me for a good bit of my life. She still slaps me down like none other – it really is physical (even though it’s just emotional). I’ve tried so many forms of defense and offense over the years, and have decided it’s absolutely useless. I’m sorry for your hurt. I truly do believe that people who love each other can hold very different views on things and still cherish and respect each other – but I’ve learned not everyone can “live” their love that way. Thanks for this thoughtful expression of a deeply tender subject. Ouch, I am very sorry to read that, Adrienne. You’re right – for the most part, your efforts with your Mom – other than trying to establish boundaries that she may never respect – can be futile. If someone’s determined to be that way there’s little we can do to change them. All we can do is put some distance between us. And the emotional battering is as painful, I think. The emotional battery whittles at your core, keeps you from peaceful dreams and causes you to second guess yourself. It’s very sneaky and dirty like that. This particular instance manifested into a physical result – I didn’t sleep. My immune system took a beating and I got sick. All because someone else decided I didn’t have a right to an opinion. That’s not OK and my take away (life lesson) is that I will never step out onto the ice with this person again. Ever. I can wish it was different but that doesn’t change it. So unless I am a sucker for punishment, I have to do the only thing I can to survive it – step away. I’m sorry you’ve been body checked. It’s hurtful and so tiring. I believe there’s always a lesson in everything. Lately my lesson has been learning to set boundaries…and I have to keep learning this lesson over and over. Still haven’t got it down. Thanks for sharing such a fragile time. Thank you, Barb. I didn’t see it coming and once I did, nearly froze to my feet. I agree, there’s always a lesson around. I tend to “give it away” – I give a lot of myself to others – and I set high expectations for others (based on what I’d do). They rarely deliver and that’s OK, because I’m used to that. But when someone negates my thoughts because it doesn’t match theirs that is not Ok and I have to learn when to step away and end the relationship. In this case, that’s what I’ve had to do here. Not easy, never fun, but necessary. Oh, I know this feeling so well. There is a difficult person in my life, and I spend every day hoping she’ll just play nice. I know that horrible feeling of being “set straight” by such a person; that feeling of immobility and shock that a grown person can behave so unfairly and be so confident about it. Sadly, most people who know this person are very aware of the tactics, and yet few do anything to stop it. I guess we’re all busy trying to be the bigger person, but just once would love to see her knocked off her high horse! I think I might know who you write of, TerriTerri. You described it perfectly — that horrible feeling of being “set straight” and that haughty look of superiority given to you (translate – how could you be so stupid) etc. My experience? The only times those people get knocked off their high horses are in the movies … I’ve never seen it happen in person. Most of us, as you describe, are nice and we don’t challenge back. We’re so horrified and immobilized that, by default, it can continue. My only recourse is to retreat … and learn. Thanks for weighing in! I had an abusive boss many years ago. I couldn’t afford to lose my job under any circumstances, and she felt she could say/do whatever she wanted. She made me miserable. She started flinging memos I’d written back at me saying “what is this GARBAGE?” I took it for a while, and then I had an assignment writing a memo on an issue she had been in charge of a few years earlier. I pulled HER memo, changed the relevant names and dates, and gave her my retyped version. I smiled and told her, politely, that since she clearly didn’t think I was up to the task, I used HER words. She stammered a bit, then said “but you write so much better than I do” and wandered away. She was never again abusive. The moral is sometimes you can win AND you can be nice at the same time. Or make it appear that way, anyway. very good point. I try hard to make sure I have time for a thoughtful comment and not write too fast … because I know it could be interpreted as flippant vs. sincere. Ignored is not OK; if I’ve ever done so it’s simply been from lack of time to respond properly, please know that. Sorry, I’ve been MIA lately. Holidays, road trips and post-holiday home clean up have gotten me so behind in the things I really enjoy…like reading my favorite blogs, present company included! It will take me some time to catch up but know this: Your posts are always so eye-opening for me. And what I mean by that is this: It isn’t just *me* that goes through these things. I had no idea. I feel a touch better already just by reading the comments posted here by other women. I’ve missed you, D, but certainly understand! I’m glad you get it — but I wish it weren’t so. I felt better by reading the supportive comments here, too. I just wish I had all these wonderful women around me in my everyday life :).